In ArcGIS Pro, your work is organized into projects. ArcGIS Pro, a new application that will come with and work with ArcGIS for Desktop, makes the GIS functionality you most often use easy to access so you can get your work done faster without a learning curve. 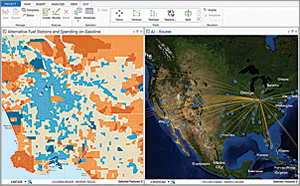 It is the essential application for creating and working with spatial data on your desktop that provides tools to visualize, analyze, compile, and share data. ArcGIS Pro joins the existing ArcGIS for Desktop applications: ArcMap, ArcCatalog, ArcScene, and ArcGlobe. 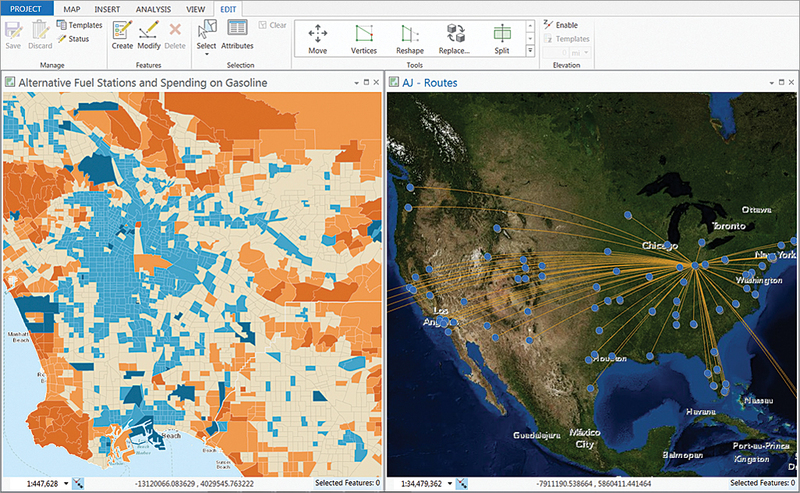 ArcGIS Pro can run side by side with any version of ArcGIS for Desktop. You can use it with existing map documents. Your work in ArcGIS Pro is organized into projects, which contain all the resources for you to do your work in one place. A project contains maps, layouts, layers, tables, tasks, tools, and connections to servers, databases, folders, and styles. It can also incorporate content from your organization's portal or ArcGIS Online. The next time you want to work on this project file in ArcGIS Pro, all the components you need are available for you to use. To get started with a project, you can gather relevant content and build your own project from scratch or start by opening a prebuilt project. Esri and others in the community have designed solutions—projects for a particular purpose or application—that contain maps and apps that can be more quickly deployed by your organization. You can find and add content to your project by browsing or searching by keywords. Create, document, discover, and share geographic information with others in ArcGIS Pro by using the basic item description or standards-based metadata for project items to find and share information more easily. 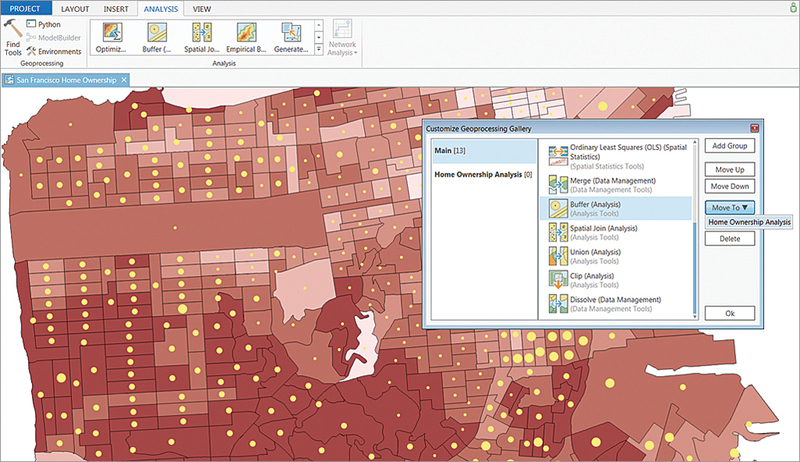 Geoprocessing provides a rich suite of tools for performing spatial analysis and managing GIS data in an automated way. Maps are the canvases on which you display your spatial data in a project. You can store as many maps as you need in the same project, and you can open multiple maps or scenes at once and view them side by side. This means you can look at the same data in 2D and 3D simultaneously. 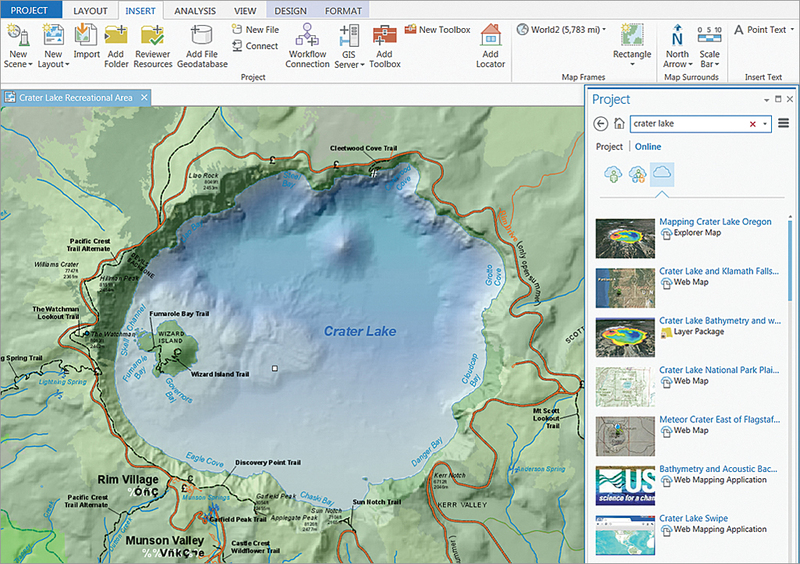 ArcGIS Pro employs industry-standard navigation functions and keyboard and mouse shortcuts that allow you to explore maps. To author a map in a project, you add layers of content to it. You can add a layer to multiple maps; for example, you might use the same imagery basemap as the underlying backdrop for many maps. Layers have properties that allow you to set how their content is displayed, including the symbols used to draw the data. While layers have spatial data, you can also add nonspatial tables. Tables are presented in a tabular view so rows and columns can be viewed, selected, edited, and queried. To display your data on a page, you can create layouts in your project. 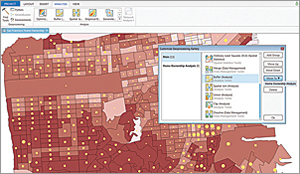 Geoprocessing provides a rich suite of tools for performing spatial analysis and managing GIS data in an automated way. A typical geoprocessing tool performs an operation on a dataset and creates a resultant output dataset. When you find the right geoprocessing tool, you specify input and output dataset locations, adjust additional parameters that affect the process, and run the tool. In addition to the suite of tools provided with the application, geoprocessing also has a framework that allows you to build custom tools. ModelBuilder is a visual language that allows you to create a diagram or model of your spatial analysis or data management process. This model is composed of graphic elements representing geoprocessing tools, data layers, and other variables and functions. Python is the scripting language of ArcGIS. ArcGIS includes a Python API, ArcPy, that gives you access to all geoprocessing tools as well as an exhaustive suite of scripting functions that help you automate GIS tasks. ArcGIS Pro provides you with the ability to create, document, discover, and share your geographic information with others. You can visualize the layers you're editing in both 2D and 3D so you can see your features from all perspectives. Editing involves creating, updating, and maintaining geospatial information that is stored and organized in layers. You can create new features in a layer by drawing them in a map and assigning attributes to define their characteristics. You can update existing features to reflect their current condition based on newly acquired data or information that comes from the field. Features can be repositioned to align with other features in a map, reshaped to represent physical changes, and removed when they are no longer needed. You can use precision drafting tools, including snapping and specified constraints, to guarantee that features are precisely connected to each other and created at the proper dimensions. If you are part of a larger organization, you need to follow standards when editing to ensure compliance and data integrity. 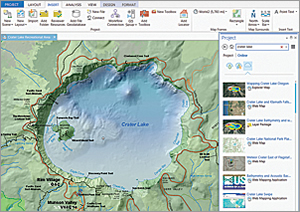 ArcGIS Pro provides the platform for this type of large enterprise editing. Editing within an organization relies on a common set of projects (maps, tools, and apps) and well-defined workflows that are used and shared throughout an organization. Projects, layers, and additional resources can be shared throughout the organization for adaption by other groups and departments. This enables the entire organization to access the most up-to-date maps and layers. Sharing your work is an important part of ArcGIS Pro. You can share everything from whole projects to maps, layers, tools, and other components of your work. There are two main ways of sharing with others: packaging and publishing. Packaging consolidates the contents into a file that the recipient will typically extract or unzip to use, while publishing builds web-based services. Project packages and geoprocessing packages are two examples of using packaging to share. Packaging a project is how you share complete projects with colleagues within your organization or others, including contractors, outside your organization. Project packages can either reference your organization's enterprise data or you can consolidate the data and include it as part of the file. You can use geoprocessing packages to share the spatial analysis and data management tools you build with other users so they can apply those tools to their work or easily reproduce your results. To share a map or scene from your project, you publish web layers. These can be reused within ArcGIS Pro, as well as across the ArcGIS platform, including in browsers and mobile devices. When you publish a layer, it can be consumed either as operational layers (those you typically work with directly or derive as the result of an operation) or as basemaps (those that are often drawn under other content, such as imagery or transportation). You can modify the properties of the layers, including their symbols, and update the service.